As I have mentioned before, I love to spoil my team and my customers. For all orders placed through me I love to send a card and a small gift. And I love to try and come up with different ways to gift wrap them too! For the card I used our notecards - perfectly sized for a small note of thanks. The birdcage and sentiment come from the Badges and Banner set. The metallic foil doilies provided a nice base over the Timeless Textures floral leaf. The black die cut bird comes from the Birds and Blooms thinlits. 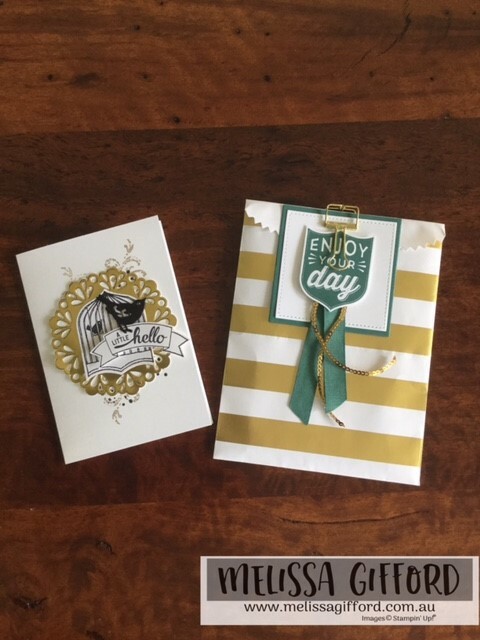 The 'enjoy your day' sentiment also comes from the Badges and Banners set. A bit of ribbon, sequin trim and a clip and the gift was done! These bags are great to have in your stash for quick gift wrapping. With the Holiday season approaching fast you can whip up some of these in no time at all!